Hello, I'm Caren Winchell, crew chief, wife, mother, and bookkeeper for an oilfield service company. I also LOVE race cars. Racing has pretty much became my life. When I come home from work, I change clothes, and head for the shop to work on the cars. That's when I'm the happiest. I'm not your normal female, instead of long pretty fingernails, mine usually are broken and have grease underneath them. Instead of soft hands, mine are cut, scraped, and callus. My hair is usually up in a pony tail and I'm usually in work clothes. I march to a different drum but it's my drum and I love it. The photo above is one the few that I am dressed up. It was taken at the Awards Banquet two years ago. Hopefully, this year I will have a new and updated picture! I am learning a lot about setting up the modified but still have so much more to learn. But there's just not enough hours in the day to go around. If I could only quit my job then I could have enough time, maybe!!! But the only way that will happen, is that I'll have to win the lottery. So until then, I'll just keep spending my nights in the shop, under a race car, or my nose in a book trying to figure it all out. Any of you guys (or gals) out there that can offer any help, it would be GREATLY appreciated. So if you happen to see a tall (6'1") blonde (and yes, it's natural and I've heard all the dumb blonde jokes) with her hair in a pony tail and a gray shirt with the pink Circle C logo on it at a race track in south central Kansas or northern Oklahoma, it's probably me. Just come over and introduce yourself, I'd love to visit. Behind every great stock car driver there is a great crew chief. 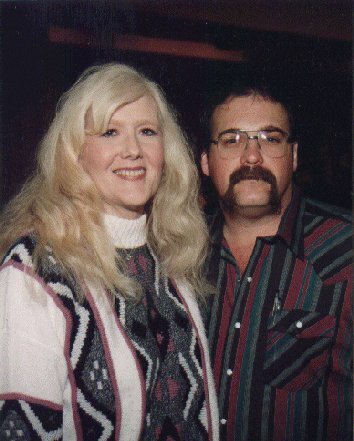 In the case of street stocker Dale Winchell the crew chief is also his wife and partner in life Caren Winchell. Winchell's thirst for knowledge has paid off, as her husband currently sits just one point out of first in the street-stock points chase at Enid Speedway and reigns as the 1996 Winter National's champion. She not only sets up her husband's Chessmen Chassis but assists other drivers with the set up on their cars. It is not uncommon to see crew members from modified teams walking the track with Caren during intermission seeking knowledge from the blonde crew chief. "We built a new car last year and racing became a passion for me, stated Winchell. "Dale is an owner/operator truck driver and leaves Sunday and gets back on Friday night or Saturday morning. It is up to me and Todd (their 15 year old son) to get the car ready. I wash the car, do repairs; and set up the chassis." Though the dual roles of husband/wife and driver/crew chief can 'sometimes put a strain on their relationship Winchell feels that they have gained more positive benefits from racing than bad. "When DaIe first started racing Todd and I were into horses', and it was pulling our marriage apart." said Winchell. "I gave up the horses and starting helping with the racing and it has pulled both our marriage and family together." Caren, as a woman made a supreme sacrifice this season for the Circle 'C' Racing Team. "My Mom chose scales for the race car over carpet for our house,", stated Todd. "She will do anything for the team"
Team sponsors include Norman's Racing Engines, T &W Tire, Forbes Auto Supply, Dark Oil, and Boyter 'I'ires. 'Greg Miller and Todd serve with Caren as faithfull crewmembers for the team. "Caren is the glue that holds this team together," said Miller.' "Dale wouldn't be able to without her"